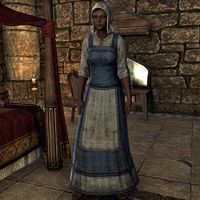 Jalinah is a Redguard laborer who can be found in the Tanners and Miners Hall of the Canton of St. Olms the Just in Vivec City. She is often busy cleaning and will not talk to you. Prior to the Homestead update, she could be found at the Sisters of the Sands Inn in Sentinel. This page was last modified on 2 March 2019, at 09:04.